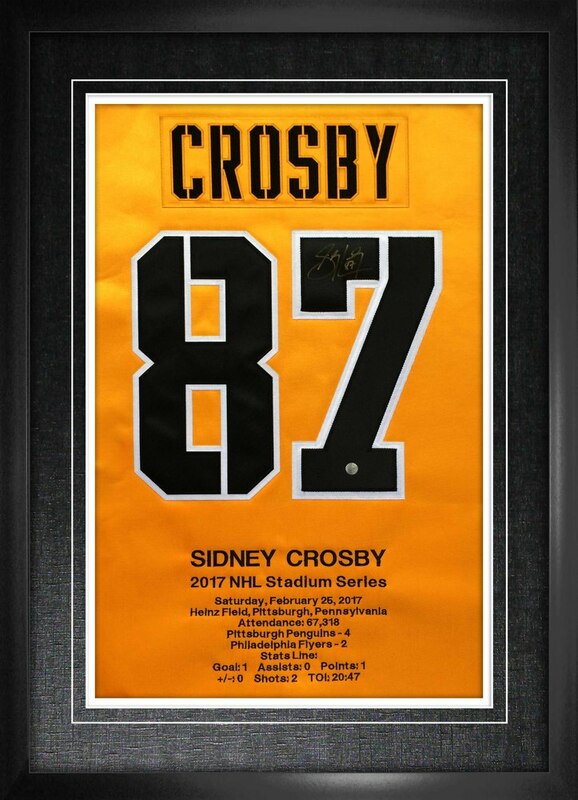 This frame comes personally signed by Penguins superstar, Sidney Crosby. Crosby had a great year in 2017, posting 44 goals and 45 assists. Pittsburgh played their State rivals, Philadelphia Flyers during this Stadium Series, topping them 4-2. The game was held in Pittsburgh at Heinz Field, with an amazing attendance of 67,318 fans, which made the game one of the most well attended outdoor NHL game in history. Crosby scored his 34th goal of the season with 2 shots on net during this game. This NHL & NHLPA officially licensed product comes with a Hologram and Certificate of Authenticity. Frameworth is the exclusive autograph provider of Sidney Crosby memorabilia. FINISHED SIZE: 22X35"